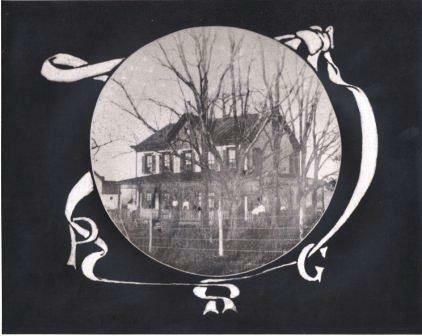 Pleasant Grove, no date, from a family album made by Esther Cummings Carolan, daughter of Cy Cummings’ brother Jim. Note the "P" and "G" on the decorative ribbon. Lent by Andrew J. Cummings, Jr. Family members stand on the porch and nearby. CCHS 1988.15.08. She sold twenty acres of land for $2,500, which is now Rollingwood. She built that house; that house only costs $2,500, but it’s a beautiful old house. This was a very large beech tree, and the big oak tree, and these are walnut trees…. When they subdivided the place, they put a road right down through there, and they tore the beech tree out and ran the road right alongside the big oak tree. 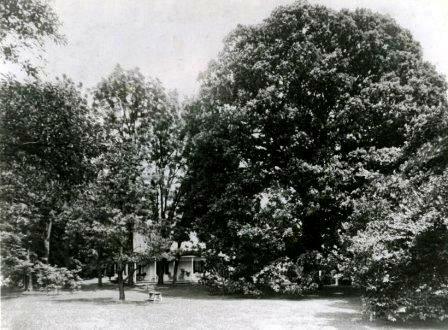 The large white oak tree, next to Pleasant Grove, obscures most of the house in this undated photograph. CCHS 2008.204.02. Mary Cummings’ house, as shown in the photograph below, is a large center cross gable house, a style popular in Maryland in the latter half of the nineteenth century. Two rooms deep and two rooms wide, it has a generous center hallway. Exterior decorative elements included fishscale shingles, an ocular window in the front gable, and a wrap-around porch which was later removed. This photograph, taken before the porch was removed, also shows the tin roof, original clapboard siding, lintel detail over the windows, and shutters. 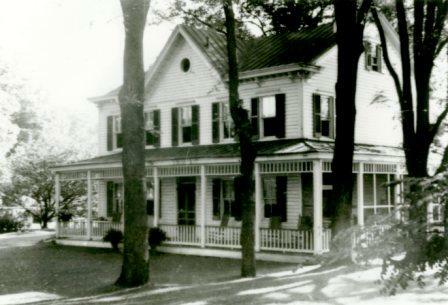 Pleasant Grove, taken before 1947, when the Cummings family sold the house. CCHS 2008.204.01. Yes, a very nice porch. We used to have rocking chairs out on our front porch; we would sit there and rock. Around the side, we had it screened in, and my father had a little cot around there where he could take a rest. There were four large bedrooms in the house. After my Aunt Cecilia died [in 1913], my Aunt Alice and Aunt Agnes shared one room, and my mother and father shared the other, and I had the third room. And the fourth room was a spare room, for guests. The house had two nice parlors. In the old days, they had a front parlor and a back parlor. We had a dining room and a large kitchen. Almost all the entertainment went on in the dining room. If you were a special guest, you got into the parlor! Today, the front and back parlors are one large room. On the attic floor, there were two additional rooms under the gabled roof. Andrew Jr. remembered hearing the rain in the attic bedrooms as it fell on the tin roof above. Each of the rooms in the house had a fireplace, except the kitchen, and a round cast iron stove sat in the fireplace. It burned coal, anthracite coal, hard coal…. They would keep the room nice and warm. A lot of heat went up the chimney.... We had a ventilator in each upstairs room that was adjustable. A blast of heat would come out of it and keep the upstairs rooms nice and warm. Except my room. My room was over the kitchen stove, and the kitchen stove would go out at night! Fortunately, my aunt [Alice] would get up early and build the fire in the kitchen stove. 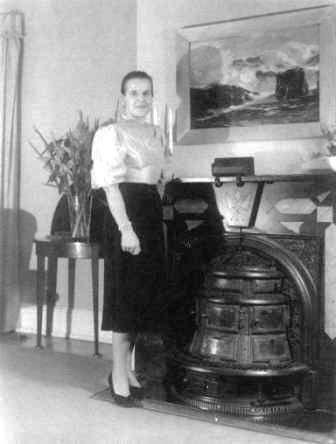 Mrs. Nelle Miles, next to the Latrobe stove in the living room, taken in the 1960s. Donated by Mary Miles Patten, CCHS 2013.06.07. The bathroom upstairs, of course, being the highest part of the system, was the first to run out of water. Somebody would go in the bathroom, they’d go to wash their hands, and there wouldn’t be any water. They’d yell down, “Turn the water on!” Somebody would have to go out and turn the pump on. Night or day, cold or rain, somebody would have to go out and turn the switch on. Click NEXT to learn about the daily farm and household chores at the Cummings Farm.